フォト金曜日＃３：上野公園花見！Photo Friday #3: Ueno Park hanami! 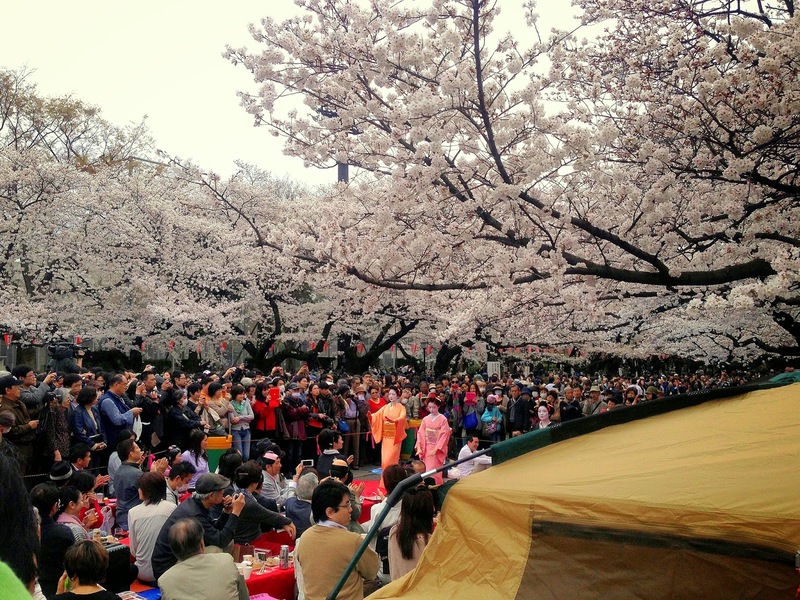 Though Ueno Park opened to the public in 1873, hanami (flower-viewing) is a centuries-old tradition, stretching back to Japan's Nara and Heian periods (794-1185) when the Japanese elite first enjoyed parties under blossoming ume (plum) and sakura trees. Since then, hanami and sakura have become an important part of Japanese history and pop culture, from inclusion in The Tale of Genji to seasonal drinks at Starbucks. As you can see in the photo above, Ueno Park, Japan's most-visited public city park, is one of the most popular spots in Tokyo for hanami. Every year, millions of people come to Ueno Park and its surrounding areas to see thousands of cherry trees in bloom. Nearby Ueno Station and Keisei Ueno Station become flooded with visitors, slowly walking shoulder-to-shoulder as they make their way to the park. I like this photo because it shows that foreign tourists aren't the only people fascinated by geisha; the entertainers are a bit of a dying breed, as fewer girls enter the profession in these modern times. Catching a glimpse of such a quintessentially Japanese sight, framed by sakura, was truly moving--and definitely worth missing our flight back to the U.S.